Candy and Halloween....that works like magic for me. Local kids don't seem to have adopted the habit of trick and treat yet. But at my home, since it mainly houses Japanese expatriates, the kids tend to ring your doorbell and ask for sweets. Hence there is always a bag of chocolates or sweets at home to make sure they don't walk away empty handed. However, I guess things will change with time since Halloween is getting rather commercial in Kuala Lumpur. Instead, the big kids seem to party more - getting dressed up in costumes to "scare" each other. Hong Kong seem to celebrate it in a huge way. Last year, I was hanging around Lan Kwai Fong and witnessed how the islanders dress up - witches, devils, YMCA guys, cavemen and etc. The amusement parks also go all out and while it was rather juvenile, I kinda enjoyed doing almost all the haunted houses in Ocean Park. They weren't that scary but more like fun to see how everyone reacted to the surprises round the corner. 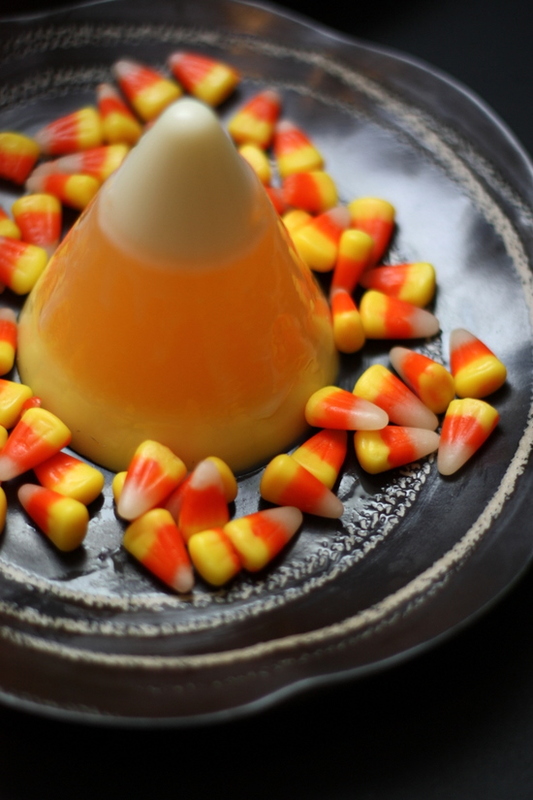 This particular jelly is inspired by the infamous candy corn from Jelly Belly (hmmm, what a great rhyme). 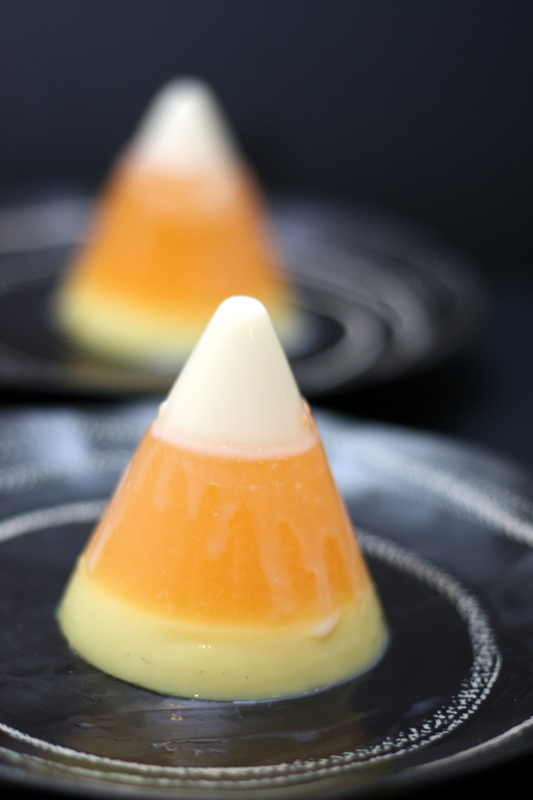 I used real condensed milk for this jelly to create the creamy milky and yellow portions. Not sure if any of you are aware but Malaysia has no condensed milk anymore. Instead we are subjected to this doppelganger version called sweetened creamer. No dairy solids within that thickened creamer but instead it is the cheaper palm oil base. Kinda sad how that has been taken from us since the taste we grew up is now gone forever. It is not that you can't source for the condensed milk anymore but the real ones are usually imported in from overseas and cost a tiny fortune (RM10 above). I often ask people to bring back a can of it from abroad (this can is from London). Sprinkle 2 teaspoons gelatine powder over 250ml water. Leave to soften. Heat up over low heat, stirring until it melts. Add condensed milk; whisk to combine. Pour 1 1/2 tablespoons of gelatine mixture in the mould. Chill until it sets. In the meanwhile, sprinkle remaining gelatine powder with water. Heat up over low heat and make sure it is melted. Add jelly powder contents, whisk to combine. Pour 8 tablespoons orange mixture on top of the milk layer. Chill to set. Colour the remaining milk mixture with yellow colouring. Pour to form bottom layer. Chill for 4-6 hours to set. Remove from the mould by dipping in hot water. A nice replica of the tiny jelly belly. hehe. Yes, it looks like a nice replica of the mini jelly belly. Have never tasted candy corn but I have a feeling it doesnt taste much of corn? And is probably very sweet. 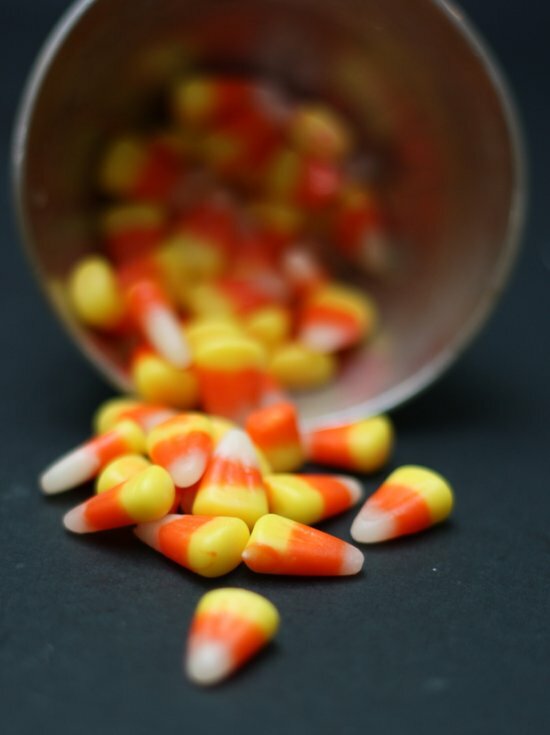 Like the idea of candy corn, mmmm love corn! thats a very smart idea! I love where you get your inpirations from. NICE!!! about a week to go..Caiyok! !